PT Bank Rakyat Indonesia (Persero) Tbk (Bank BRI) is an Indonesia-based financial institution. It is engaged in banking activities and its products and services include savings, loans, consumer products and investment banking. As a state-owned bank (BUMN), BRI played a key role in realizing the government’s vision in the development of people’s economy. In 1960, the government change BRI’s name into Bank Koperasi dan Nelayan (BKTN). Based on Law No.21 of 1968, the government renamed the bank BRI and it became a public bank. 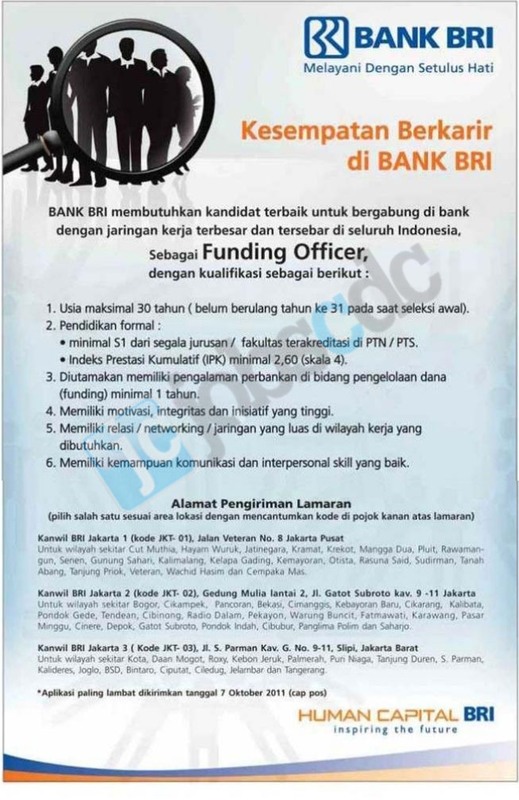 Later, based on Banking Law No.7 of 1992, BRI had its name and legal status of its entity changed to PT. Bank Rakyat Indonesia (Persero). With a focus on micro, small and medium businesses, BRI has inspired a lot of other organizations to empower the businesses in these sectors as they are the backbone of the Indonesian economy. Only shortlisted candidates will be notified. Closing date 7 October 2011.